The Constitution of the Communist Party of China (CPC) has 53 Articles and includes contents of General Program, Membership, Organization System, Central Organizations, Local Organizations, Primary Organizations, Party Cadres, Party Discipline, Party Organs for Discipline Inspection, Leading Party Members' Groups, Relationship Between the Party and the Communist Youth League, Party Emblem and Flag. An ex officio member is a member of a body who is part of it by virtue of holding another office. The term ex officio is Latin, meaning literally "from the office", and the sense intended is "by right of office"; its use dates back to the Roman Republic. Xi Jinping is a Chinese politician serving as general secretary of the Communist Party of China (CPC), president of the People's Republic of China (PRC), and chairman of the Central Military Commission (CMC). Often described as China's "paramount leader" since 2012, he officially received the title of "core leader" from the CPC in 2016. As general secretary, Xi holds an ex-officio seat on the Politburo Standing Committee of the Communist Party of China, China's top decision-making body. 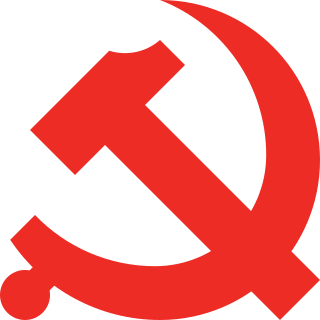 The 12th Central Committee of the Communist Party of China was in session from September 1982 to November 1987. It held seven plenary sessions. It was securely succeeded by the 13th Central Committee. The Central Politburo of the Communist Party of China, formally known as the Political Bureau of the CPC Central Committee and known as Central Bureau (中央局) before 1927, is a group of 25 people who oversee the Communist Party of China. Unlike politburos of other Communist parties, power within the politburo is centralized in the Politburo Standing Committee, a smaller group of Politburo members. A one-party state, single-party state, one-party system, or single-party system is a type of state in which one political party has the right to form the government, usually based on the existing constitution. All other parties are either outlawed or allowed to take only a limited and controlled participation in elections. Sometimes the term de facto one-party state is used to describe a dominant-party system that, unlike the one-party state, allows democratic multiparty elections, but the existing practices or balance of political power effectively prevent the opposition from winning the elections. The Central National Security Commission of the Communist Party of China (CPC) was established at the 3rd Plenary Session of the 18th Central Committee in November 2013, and was considered a "major regrouping of the top CCP power structure." ↑ "Xi's here to stay: China leader tipped to outstay term". Daily Mail. 9 August 2016. "A lot of analysts now see it as a given" that Xi will seek to stay party general secretary, the country's most powerful post, said Christopher K. Johnson, a former CIA analyst and now China specialist at the Washington-based Center for Strategic and International Studies. The Central Military Commission (CMC) refers to the parallel national defense organizations of the Communist Party of China and the People's Republic of China: the Central Military Commission of the Communist Party of China, a Party organ under the CPC Central Committee, and the Central Military Commission of the People's Republic of China, a central state organ under the National People's Congress, being the military branch of the national government. The Orders of precedence in China is the ranking of political leaders in China for the purposes of event protocol and to arrange the ordering of names in official news bulletins, both written and televised. It is also sometimes used to assess perceived level of political power. Although there is no formally published ranking, there is usually an established convention and protocol, and the relative positions of Chinese political figures can usually be deduced from the order in meetings and especially by the time and order in which figures are covered by the official media. In modern Chinese politics, the paramount leader of the Communist Party of China and the government of China is an informal term for the most prominent political leader in the People's Republic of China. The paramount leader is not a formal position nor an office unto itself and the term gained prominence during the era of Deng Xiaoping (1978–1989), who was able to wield power without necessarily holding any official or formally significant party or government positions at any given time. Since both the Communist Party of China and the People's Liberation Army promote according to seniority, it is possible to discern distinct generations of Chinese leadership. In official discourse, each group of leadership is identified with a distinct extension of the ideology of the party. Historians have studied various periods in the development of the government of the People's Republic of China by reference to these "generations". The Central Foreign Affairs Commission, formerly known as the Central Foreign Affairs Leading (Small) Group is a commission of the Central Committee of the Communist Party of China that exercises general oversight on matters related to foreign affairs. It is currently chaired by Party General Secretary and President Xi Jinping, who is assisted by its office director and Premier Li Keqiang is deputy director. Politburo member Yang Jiechi, and its membership includes officials of minister-rank and above. Li Zhanshu is a Chinese politician, and the current Chairman of the Standing Committee of the National People's Congress, head of China's top legislative body. He is a member of the Politburo Standing Committee, China's top decision-making body. Li began his political career in rural regions of his native Hebei province, methodically rising through the ranks as the Communist Party Secretary of Xi'an, Governor of Heilongjiang province, and the Party Secretary of Guizhou province. In 2012 he was transferred to become chief of the General Office of the Communist Party of China. Following the 18th Party Congress, Li became one of the top advisors to party General Secretary Xi Jinping. The 18th National Congress of the Communist Party of China began on November 8, 2012 at the Great Hall of the People. It was preceded by the 17th National Congress of the Communist Party of China. Due to term and age limits restrictions, seven of the nine members of the powerful Politburo Standing Committee (PSC) retired during the Congress, including Hu Jintao, who was replaced by Xi Jinping as General Secretary of the Communist Party of China. The Congress elected the 18th Central Committee of the Communist Party of China, and saw the number of Politburo Standing Committee seats reduced from nine to seven. It was succeeded by the 19th National Congress of the Communist Party of China. The succession of power in the People's Republic of China (PRC) takes place in the context of a single party system. Despite the guarantee of universal franchise in the constitution, the appointment of the Paramount Leader lies largely in the hands of his predecessor and the powerful factions that control the Central Committee of the Communist Party of China. The appointment of the leader of the world’s most populous country occurs after two five year terms in accordance with the Constitution of the People's Republic of China. The Central Financial and Economic Affairs Commission, formerly known as the Central Leading Group for Financial and Economic Affairs from 1989–2018, is a commission of the Central Committee of the Communist Party of China at the dependence of the CPC Politburo in charge of leading and supervising economic work of both the CPC Central Committee and the State Council. The Commission is headed by CPC General Secretary or Premier of the State Council. The Central Leading Group for Taiwan Affairs is an internal policy coordination group of the Central Committee of the Communist Party of China and the State Council of the People's Republic of China, reporting to the Politburo, in charge of supervising and coordinating Beijing's policy towards Taiwan, including developing cross-strait relations. It was established in 1979 and has been led by the General Secretary of the Communist Party of China since 1989. The 18th Central Politburo of the Communist Party of China was elected by the 18th Central Committee of the Communist Party of China on 15 November 2012, which was formally elected by the 18th National Congress of the Communist Party of China. It was nominally preceded by the 17th Politburo. It was ultimately succeeded by the 19th Politburo of the Communist Party of China. The Central Comprehensively Deepening Reforms Commission, formerly known as the Central Leading Group for Comprehensively Deepening Reforms is a policy formulation and implementation body set up under the Politburo of the Communist Party of China in charge of "Comprehensively Deepening Reforms". These reforms are intended to be even more far-reaching than the previous round of comprehensive Chinese economic reforms initiated by Deng Xiaoping. The Leading Group for National Defence and Military Reform of the Central Military Commission is a policy formulation and implementation body set up under the Central Military Commission of the Communist Party of China and ultimately answerable to the Central Committee of the Communist Party of China for the purpose of formulating policies related to military reform. The group is headed by Xi Jinping, General Secretary of the Communist Party of China and Chairman of the Central Military Commission. The President of the People's Republic of China is the head of state of the People's Republic of China. Under the country's constitution, the presidency is a largely ceremonial office with limited powers. However, since 1993, as a matter of convention, the presidency has been held simultaneously by the General Secretary of the Communist Party of China, the top leader in the one party system. The office is officially regarded as an institution of the state rather than an administrative post; theoretically, the President serves at the pleasure of the National People's Congress, the legislature, and is not legally vested to take executive action on its own prerogative. The current President is Xi Jinping, who took office in March 2013. ↑ "文革后的中南海：中央办事效率最高的时期". LYWZC.com. Comsenz Inc. Retrieved 7 February 2018. .
↑ Li, Xiaoqing (2015-06-10). "卓琳以死相逼之前 曾被江泽民一度糊弄". Epoch USA, Inc. The Epoch Times. Retrieved 10 February 2018. ↑ Chris Buckley and Adam Wu (10 March 2018). "Ending Term Limits for China's Xi Is a Big Deal. Here's Why. - Is the presidency powerful in China?". New York Times. In China, the political job that matters most is the general secretary of the Communist Party. The party controls the military and domestic security forces, and sets the policies that the government carries out. China’s presidency lacks the authority of the American and French presidencies. ↑ "China's 'Chairman of Everything': Behind Xi Jinping's Many Titles". The New York Times. 25 October 2017. Mr. Xi’s most important title is general secretary, the most powerful position in the Communist Party. In China’s one-party system, this ranking gives him virtually unchecked authority over the government. ↑ 习近平频现身成常态 将回归"领导核心"？. Duowei News. January 7, 2014. ↑ "How the Chinese government works". South China Morning Post. Xi Jinping is the most powerful figure in China's political system, and his influence mainly comes from his position as the General Secretary of the Chinese Communist Party.